The San Francisco 49ers have always been one of the most respected organizations in professional sports. They have a lot to be proud of. They have five Super Bowl trophies and now a new world-class home at Levi’s® Stadium. As of today, they are also the first professional sports team to help secure the financial health of their front-office employees and alumni with free, automated investment services. The San Francisco 49ers will cover the advisory fees on the first $100,000 each individual invests with Wealthfront. Wealthfront will also provide financial education for both current employees and alumni through its acclaimed seminars. Wealthfront is designed with the millennial investor in mind, and we learn a lot from our clients about how millennials are finding success today. Last year, when Wealthfront spread to all 50 states, we saw an interesting pattern develop: professional athletes signing up for the service. As a result, we started looking into the specific financial challenges that face athletes and former athletes and how they navigate issues associated with windfalls. A windfall is a term normally associated with money received outside of your normal income. In Silicon Valley, the most common type of windfall is a one-time liquidity event, like an IPO. It’s not unusual for an engineer or designer to work for years without a bonus or significant raise, only to receive a significant multiple of her annual salary when her company is acquired or goes public. Windfalls, however, can take many forms: a bonus, an inheritance, or even winning the lottery. It might be hard to imagine, but while this type of event is generally considered good news, it does bring with it a set of new financial challenges. As with many financial decisions, windfall events are often coupled with powerful emotions, and they are rarely the right ingredients for sound, long-term financial thinking. There are a lot of different ways that millennials find success, and professional athletics is definitely one of the most well known. 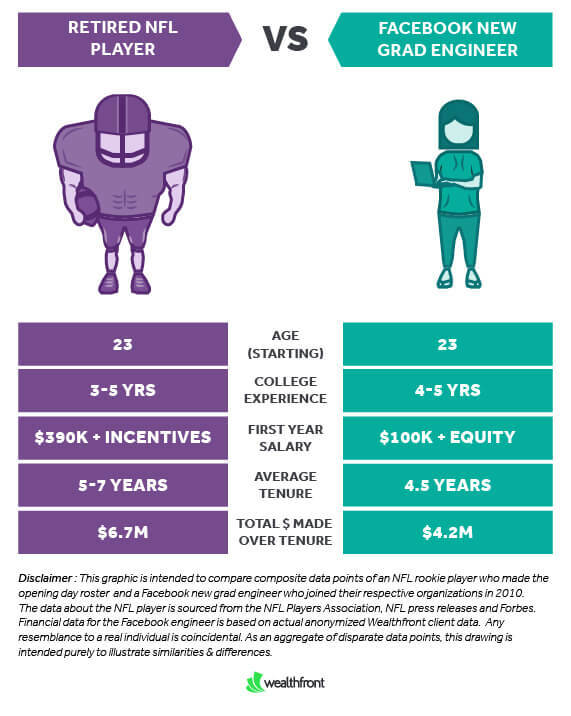 The average NFL player has a career of 5-7 years, and while their income during those years is extremely high they need to plan for the future beyond their playing career. At Wealthfront, we believe everyone deserves sophisticated financial advice. 2014 has been a record-breaking year for Wealthfront, as millennial investors have overwhelmingly made us the largest and fastest-growing automated investment service in the country. With more than $1.3B dollars under management from clients in almost every imaginable profession living in all fifty states, we’re excited to be working with the San Francisco 49ers to extend the benefits of automated investing to an even broader millennial audience. Adam Nash, Wealthfront's CEO, is a proven advocate for development of products that go beyond utility to delight customers. Adam joined Wealthfront as COO after a stint at Greylock Partners as an Executive-in-Residence. Prior to Greylock, he was VP of Product Management at LinkedIn, where he built the teams responsible for core product, user experience, platform and mobile. Adam has held a number of leadership roles at eBay, including Director of eBay Express, as well as strategic and technical roles at Atlas Venture, Preview Systems and Apple. Adam holds an MBA from Harvard Business School and BS and MS degrees in Computer Science from Stanford University.